On last July 21  the Folha de São Paulo published a picture of Our Lady in New Orleans, which shows a statue of Our Lady of Fatima shedding tears. The article raised a lively interest in the public of São Paulo. I think, therefore, that some information on the topic will satisfy the wish of many readers to know more. I don’t know a better source on the topic than an article with a very American title: “The tears of Our Lady wet my finger.” Its author is Fr. Elmo Romagosa. It was published July 20 in the New Orleans weekly Clarion Herald and distributed in eleven parishes of Louisiana. The background of this fact is universally known. In 1917 Lucia, Jacinto and Francisca received various visions of Our Lady in Fatima. The authenticity of those visions was confirmed by various extraordinary phenomena that happened in the sun, witnessed by a multitude gathered at the place while the Holy Virgin was manifesting herself to the three children. In short, Our Lady told the small shepherds to convey to the world that she was deeply saddened by the impiety and moral corruption of men. If they did not correct their lives, a terrible chastisement would come. Nations would disappear from the face of the earth. Russia would spread its errors everywhere. The Holy Father would have to suffer a great deal. The chastisement would only be avoided if men converted, if Russia and the world would be consecrated to her Immaculate Heart, and the Communions of reparation on the First Saturday of each month be made. With this presupposition, the question that naturally comes to mind is if those requests were fulfilled. In 1942, Pius XII made a consecration of the world to the Immaculate Heart of Mary. Sister Lucy affirmed that the act was missing some of the requirements indicated by Our Lady. I do not intend to analyze the complex issue here. I just report, in passing, that it is open to discussion whether or not this request of Our Lady was fulfilled. Regarding her second request, that is, the conversion of humankind, it is so obvious that it has not been done that I dispense myself from commenting on it. Since Our Lady established the fulfillment of her requests as a condition to avoid the apocalyptic chastisements predicted by her, it is logical that the punitive and purifying wrath of God shall fall over humankind before its conversion and the installation of the Reign of Mary. Among the three children of Fatima, the only one still alive [in 1972] is Lucy, today a Carmelite religious in Coimbra. 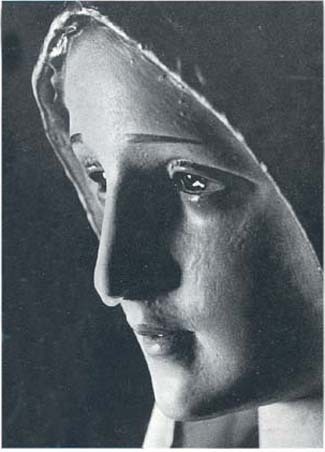 Under her direct supervision, an artist carved and painted two statues that correspond as far as possible to the appearance of the Most Holy Virgin at Fatima. Both statues, called “pilgrim” statues, have traveled throughout the world, carried by priests and laymen. One of them was brought to New Orleans, where she shed tears. Fr. Romagosa, author of the article I mentioned, had heard about these tears from Fr. Joseph Breault, M.A.P., the guardian of the statue, He had great difficulty in admitting the miracle. For this reason, he asked the other priest to call him immediately should the phenomenon occur again. On July 17, Fr. Breault noticed some moisture on the eyes of the pilgrim Virgin and called Fr. Romagosa, who arrived at the place at 9.30 p.m., accompanied by photographers and reporters. All of them noticed certain moisture on the eyes of the statue, which was recorded in the pictures. Then, Fr. Romagosa touched his finger to a wet spot and collected a drop of the liquid, which was also photographed. According to Fr. Breault, this was the 13th time he had witnessed the statue weeping. At 6:15 the next morning, Fr. Breault called Fr. Romagosa again, informing him that since 4 a.m., the statue had been weeping. Shortly afterward, Fr. Romagosa arrived at the place where, he said, “I saw a good quantity of liquid on the eyes of the statue, and a larger drop of the liquid on the tip of its nose.” It was the picture of this graciously suspended teardrop that the newspapers printed for our public. But, he wanted to remove all doubts. He had noted that the statue had a crown fixed on top of the head by a metal peg. A question came to his mind: Would someone have introduced liquid into the hole for the peg, which could then penetrate the wood and appear at the eyes? Soon after the weeping stopped, Fr. Romagosa took off the crown from the statue’s head: the metal peg was completely dry. He inserted in the hole a wire covered with a special paper that would absorb any liquid that might be there. But the paper came out absolutely dry. Not satisfied with this experiment, he poured some liquid into the hole. Notwithstanding, the eyes of the statue remained absolutely dry. Fr. Romagosa turned the statue upside-down and all the liquid he had poured there flowed out naturally. It was fully demonstrated that from the hole in the head – the only one that existed in the statue – no infiltration of liquid to the eyes was possible. Fr. Romagosa knelt down. Finally he believed. The mysterious weeping shows us the Virgin of Fatima crying over the contemporary world as Our Lord wept over Jerusalem. These were tears of profound pain that foretell the chastisement that will come. It will come to men of 20th century if they do not renounce their impiety and moral corruption. If they will not fight against the auto-demolition of the Church, the cursed smoke of Satan, which even Paul VI said had penetrated the sacred place. So, my reader, it is still time to avoid the chastisement. Someone may object that this is not a meditation for a relaxing Sunday. Isn’t it preferable, I respond, to read this article today about the tender manifestation of our Mother’s prophetic sadness than to have to bear the tragic and bitter days to come if we do not correct ourselves? If they do come, I think it is logical to expect at least a special mercy for those who had taken the miraculous warning of Mary seriously. 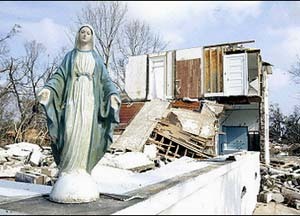 Whole neighborhoods in New Orleans were submerged in the aftermath of hurricane Katrina. and on the TIA website, September 4, 2005.